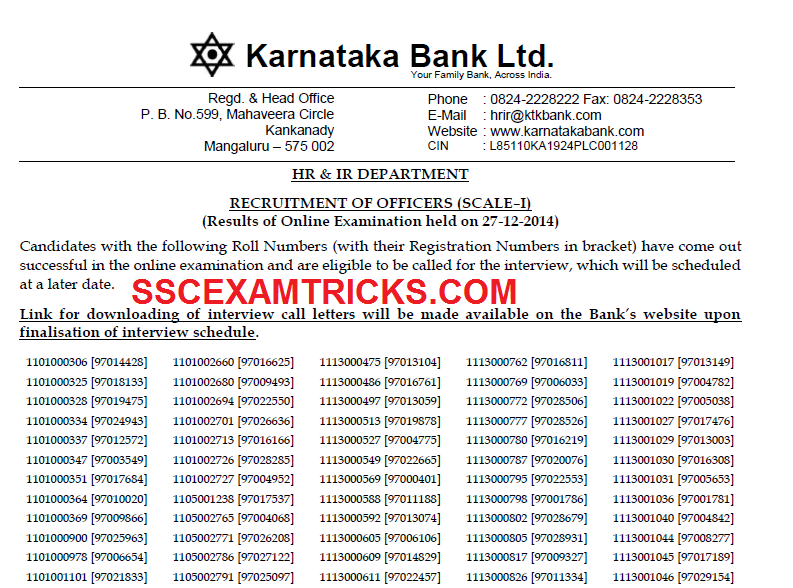 Karnataka Bank has released roll number wise / registration number wise result / list of short qualified candidates of online examination held on 27th December 2014 at Bangalore, Bagalkot, Belgaum, Bellary, Bidar, Bijapur, Chennai, Chikmagalur, Chikkaballapura, Davangere, Dharwad, Gadag, Gulbarga, Haliyal (near Hubli), Hassan, Haveri, Hubli, Mandya, Mangalore, Mysore, Shimoga, Tumkur and Udupi Centres for the posts of Officer Scale 1. These short listed candidates will be called for interview and interview date will be announced on the official website of Karnataka Bank. Those candidates who had appeared in online exam and waiting for result for the posts of SCALE 1 can download List of short listed candidates for interview from the direct link provided in the end of the post. · Download Result in PDF. · Press Ctrl + F to search your name in the result page. · Type your roll no. or registration number in the search box. · Press Enter till you find your roll number or registration number in the result page. · Save or Print the Result Page for Interview requirements. The selection for the posts of Officer Scale 1 will be based on the performance in online examination and interview. The Karnataka Bank Exam was conducted on 27th December 2014. The Karnataka Bank exam was conducted by Online MODE. In ONLINE Mode, the exam was entertained through filling of circles on Computer Generated Page containing information of answers which was selected by filling circle in it. There was no OMR sheet was filled by Blue/Black ball point pen. A rough blank sheet was issued for calculations/rough work in exam. This rough sheet must have been submitted to the duty officer in the end of the exam. The exam was conducted an objective multiple choice question paper of 250 marks to be done within 2 hours or 120 minutes. The exam was consisted of four sections contains questions of English (50 Marks), Reasoning (50 Marks), General Awareness (50 marks) and Computer Knowledge (50 marks). The exam was a multiple choice question paper in which five options were provided out of which candidates need to choose one correct answer. There was 1/4th negative marking allotted for each wrong answer. All short listed candidates must reach the venue of Interview at least 20-30 minutes before the time mentioned on the interview letter of the candidate. Selected candidates are required to bring computer generated online application, result print, original documents (10th, 12th, UC DMC, Cast certificate –If applicable etc.) and one set of self-attested of all the documents to the venue of interview. 10th Certificate is used for Age Proof. Candidate must bring at least one Address proof i.e. PAN Card, Ration Card, Aadhar Card, Voter card or Driving License. Candidates are advised to bring two extra colored recent passport size photograph (same as pasted on computer generated application form) required for application form or other document requirements. Candidate must bring Caste/PWD/EXS certificate to claim for seat available for reserve category. If the candidate is an employer of any organization then it is mandatory to bring original as well as photocopy of NOC (No Objection Certificate) with them.